I hope the levels are all there because that was outstanding! Ok Canada, you can breath again now... WOW! Everything about that was sooo smooth and free... much more so than in the team event. Scott was so pumped at the end! And it's 76.33 for Tessa and Scott, moving them into first place!! They got a level 3 on one of the Finnstep sequences but level 4 on everything else. Good job! I'm off to the mixed zone to see what they have to say. Solid skate for Bobrova and Soloviev they score 69.97 and sit in second right behind defending Olympic champions Tessa and Scott! 144.78 for Guignard and Fabbri, that puts them in 4th place for the time being. Ice resurfacing about to take place. Really exciting stuff. Too exciting for pictures. this break will include Kaitlyn Weaver and Andrew Poje. We're about to get going again. The next flight has emerged from backstage. 3rd fight on the ice warming up. Kaitlyn and Andrew skate last in this flight. Kaitlyn and Andrew have a phenomenal free dance. I'm not usually a fan of tangos, but theirs really draws me in. Alright, we're ready to start with Nelli Zhiganshina and Alexander Gazsi, They've made an interesting choice to link their short and free dances. Last night, girl met boy and they had a good time before falling asleep in a park. Now we'll pick up with them waking up. Saw them perform this short-free link at Skate Canada. It's a crowd favourite, judges don't seem to be as pleased, usually. He plays the role of the nerd so well. But I think I prefer the short dance to the free dance. Muted crowd right now for the first skater on the ice, Nicole Rajcova of Slovakia. Curious to see what it will be like when Yuna Kim gets out there. I remember it being madness at the 2009 Four Continents and 2009 World Championships, the first times I saw her live. 49.80 for Rajicova, she is currently in 6th place. Ukolova from the Czech Republic up next. 51.87 for Ukolova, putting her in 6th place for now. Anne Line Gjersem of Norway is on the ice now. 48.56 for Gjersem, she sits in 10th place. Gedevanishvili from Georgia up next. 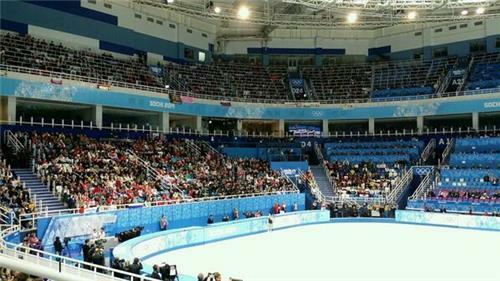 Bit of a spike in applause for this skater from Russia's neighbouring country. I remember when I first saw Gedevanishvili at Turin 2006. She seemingly came out of nowhere to have a great short program. Good to see that from her again here. Gedevanishvili scores 54.70 and sits in 4th. Her jumps really do just float through the air. Beautiful entrance into the double axel and great flow coming out of it. i could watch her skate all day! So elegant on the ice. I think every flower girl had to be put into action after that skate. It's raining flowers and teddy bears in here! Yuna really is a special skater. 74.92 for Yuna! Huge score! One of my most favourite pieces of music skated brilliantly by @Yunaaaa . What a legend.